The Coleus plant is, by far, one of the most popular house plants ever, but is also fast becoming a sought-after annual, one that provides amazing color and contrast for perennial beds past their bloom and for those partially shaded areas for which color is hard to come by. However, Coleus is a somewhat fragile annual; one that requires a bit of TLC in order to reap its colorfully impressive rewards. Your Coleus plants will arrive in a 3-inch pot. We have carefully nurtured your coleus plant in our greenhouse, providing it with the proper amount of sunlight and nutrients in order to ensure it grows the best root system possible. Your coleus plant, however, has not been subjected to wind and full sun, so should be hardened off before actually being planted in the ground or in a fully exposed area in a pot. Hardening off is the process of acclimating a plant to its new habitat. You do the same thing for vegetable seedlings you've started at home, moving them outside for longer and longer periods of time where they are exposed to the elements and can therefore survive more easily when first transplanted into the garden. The same method is wisely used for any new transplant. Start by moving them into a partially shaded area that is protected from the wind, gradually moving them to an area with the same conditions as the one they will be planted in. Be weather-aware and be sure to provide shelter or bring them inside if the nighttime temps are expected to drop below 40°F and if high winds, driving rain or hail are expected. This whole process should take no longer than a week to a week and a half, but will virtually guarantee the most beautiful and healthy Coleus plants possible. We recommend transplanting your newly acquired Coleus into a pot with good quality planting soil within a couple of days of its arrival. Immediately upon receipt, remove the plant(s) from the shipping box and put them in a shallow glass baking dish or some other suitable container and make sure that the soil stays moist, but that the shipping pots are not sitting in standing water for any length of time. We also suggest that you mix water with our highly concentrated Neptune's Harvest and just pour a little into the container at a time until the plants have soaked up the water. Pour off any excess and leave them for 15 minutes before potting, or leave them like this for up to three days, but no longer. When we shipped them to you they were most likely already starting to outgrow their shipping pots. Neptune's Harvest helps your plants to more quickly overcome the stress of shipping and will give a boost of essential nutrients to get them off to a great start. 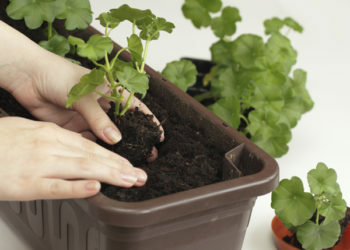 If transplanting to a permanent pot or container, the process is quite simple. Choose a pot with a drainage hole in the bottom, or one of any number of decorative hanging baskets. 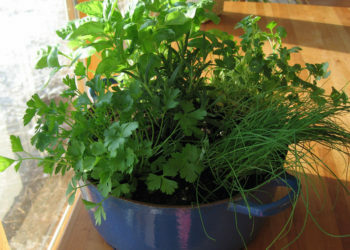 Of course, the ultimate destination for that pot, be it inside or out, will determine your container needs. One or two coleus will fit well in a 6 to 8 diameter pot, while a larger pot may hold three or four. The best potting soil will have lots of organic material and may even contain a slow-release fertilizer. If you live in a particularly hot area and your coleus plant(s) will be hung or placed outside, you may also want to consider adding water crystals to the soil. They expand, holding 100s times their weight in water, releasing it as the soil starts to dry. Using these will reduce your household water bill and keep your coleus hydrated, even on the hottest days. And never place your Coleus plant where it will have all day direct sunlight! The newer cultivars are much more sun-resistant, but Coleus will not thrive well in all day sun throughout the summer. The best combination is full morning sun, as sun seems to produce more colorful plants, and then afternoon partial shade, especially in the heat of the summer. If you have your plants in pots, you can even move them in and out of the sun as necessary, most easily accomplished if you have them on a rolling cart or trolley. You will know that your coleus plant is getting too hot when its colors seem to fade and it wilts, even when well hydrated. Coleus recovers quickly from wilting once watered, but too much repeated water deprivation will result in a faded, unhealthy plant over time. For your Coleus plants that will be going directly into the ground, we strongly recommend you transplant them into a larger pot in order to harden them off and then ultimately put them directly into your flower beds. Again, location is important. If you are not quite sure that an area is suitable (morning sun and afternoon partial shade), you can either monitor your planned area throughout a couple of days, or get an inexpensive light tester to measure the amount of sunlight an area receives, even if indoors. Also keep in mind your geographic location. Full sun in Texas or Arizona is much stronger than full sun in northern climes. Planting your Coleus plants into a peat or organic material pot will preclude your having to stress the plant further when transplanting, though once you've given them a couple of weeks in a pot and have hardened them off properly, this shouldn't be an issue. The choice, of course, is totally yours. Many people save their nursery plastic pots, just for a purpose such as this, which makes perfect sense. You have re-purposed the pot without spending any more money, and have probably also proven to your significant other that you weren't at all out of your mind when you decided to save them in the first place! Amazingly, Coleus plants don't respond well to over feeding. Besides adequate moisture, you will find that your Coleus' colors are much more vivid when the plants are just a little neglected. If you fertilize, use a slow release or feed at half the recommended strength. We also highly recommend mulching your Coleus plants if planting in the ground, especially in hotter climates. This not only retains life-giving moisture, but will inhibit the growth of weeds and grasses. If you water with a sprinkler or hand-held nozzle, make sure to water after the full sun has left your plants, but with enough time for the leaves to dry before it turns dark. Wet nighttime foliage on any plants can lead to fungal diseases, mold or mildew occurring and wet leaves in full sun can burn the plant. Finally, pinching the growing tips of your Coleus plants will encourage fuller and bushier growth. For blooming Coleus, you can pinch the bloom or allow it to remain, though Coleus blossoms are mostly insignificant and do not noticeably add or detract from the beauty of the plant. You may find that in mid-summer pinching will help the plant to maintain its bushy appearance and keep its shape, but that is largely a personal preference as well, just as are the colors you have chosen. Speaking of colors, these annual plants are available in just about every color of the rainbow! Though it may be tempting to buy some of every color, planning in your head for the mixture of textures and colors will result in the most beautiful indoor and outdoor decorating and the personal satisfaction that comes from a job well done! The Dracaena Spike - A Perennial? Is it Fuschia or Fuchsia? 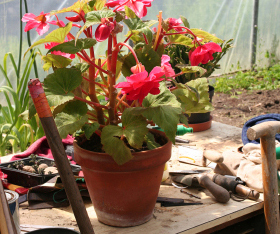 Growing Begonias Not As Hard As You Think!